Looking for a quick and delicious salad recipe idea? Try our Jewelled Layered Salad at your next get together. 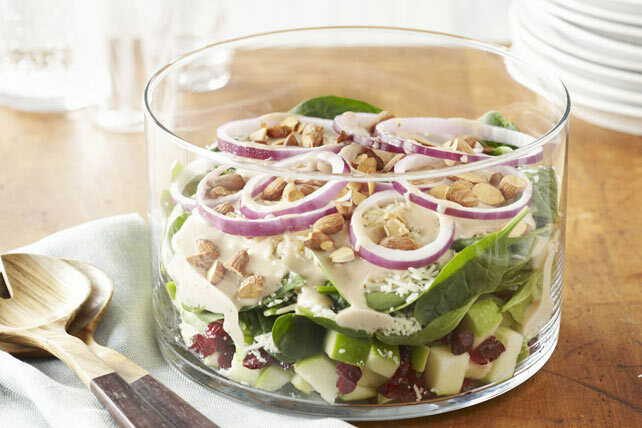 This salad combines sweet and savoury flavours - it's sure to be a hit with your guests. Toss apples with lemon juice; drain. Place in 4-L glass bowl. Add cranberries; mix lightly. Cover with layers of spinach, cheese, dressing and onions. Refrigerate 4 hours. Add nuts just before serving; mix lightly. Tossing the chopped apples with the lemon juice helps to prevent them from turning brown. Serve salad immediately after assembling it. No need to refrigerate first. Substitute fresh pears for the apples.